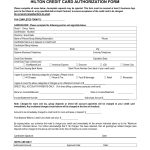 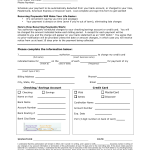 Download credit card authorization templates in Adobe PDF, Rich Text Format (.rtf), and Microsoft (MS) Word to accept payment for a product or service. 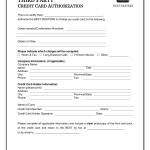 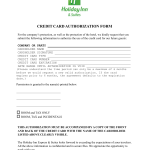 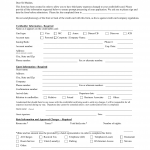 The document may be filled in on a computer or handwritten after printing and the details of the payee must be detailed including their full name, date of payment, amount, description of purchase, billing address, phone number, email, cardholder name and number, expiration date, and he CVV2 (3 digits for Visa/MasterCard and 4 digits for AMEX). 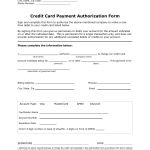 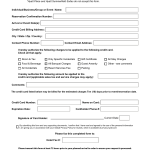 In addition a copy of a government issued ID should be attached to the form.